Can you fully enjoy the experience if you don't live in a country where the film is in theaters? Alex Garland wrote 28 Days Later, Sunshine and Dredd, establishing his bona fides as a master of blending horror and mind-bending sci-fi. He then wrote and directed Ex Machina, which propelled him into an elite fraternity of directors producing smart, arty films that stick with you long after you leave the theater. His latest film, Annihilation, was set to be his big mainstream breakthrough, but it will be released theatrically only in the US, Canada and China. In the rest of the world, the film will play on Netflix. Does that mean everyone in the rest of the world is losing out by having to watch it in the comfort of their own homes? We asked two of our editors -- one in New York and one in London -- to report their respective experiences. After seeing Annihilation in a packed New York City theater on opening night, I had two thoughts. I was grateful to experience such a gorgeous, transcendent film with a group of strangers, on a giant screen that demanded our attention. And I felt sorry for audiences outside of the US, Canada and China who won't have the opportunity to experience it in theaters. If this is the future of film distribution, I fear that we're losing something essential. As someone who deeply admired Alex Garland's Ex Machina and Jeff VanderMeer's original novel Annihilation, my expectations were high for the movie. But I was a bit worried when Paramount announced its unusual split distribution strategy. Not so much because I feared it meant the film was bad; rather, it seemed as if the studio was just dumping it to make some quick cash, instead of doing the work to get people into theaters. I suppose that's understandable for Paramount, though, following a string of box office failures and a rough few years of earnings. Ex Machina also suffered at the box office internationally, making a mere $11.4 million (on top of its $25.4 million domestic gross). A Netflix deal would certainly fetch more for Paramount, and, of course, it would give even more people access to the film. Perhaps that's the best way to put it. Seeing a film in a theater, especially a film as masterful as Annihilation, is a bit like going to church. It soothes my soul, and I feel even more at ease when I'm with an audience that's seeing the light. At home on my couch, it's like trying to find enlightenment from a televangelist. If you want to get pedantic about it, there's a film theory term -- scopophilia -- which denotes the pleasure you get from watching something. And in a big, darkened room full of similarly awestruck viewers, you're more drawn into the world unfolding in front of you. And Annihilation has one hell of a world, full of weird, off-kilter visuals that mix the joy of nature with extreme body horror. But I wouldn't go so far as to say that the film has -- as Devindra says above -- an "epic scope and rich sound design." That said, a lot of the film is composed of medium-frame shots, and you'll be spending a lot of time looking at Natalie Portman staring out beyond the frame. Nothing wrong with that, of course, but if you'd told me this was a TV movie on a quarter of the budget, I would have believed you. And that's something that affected Garland's last movie, too, since Ex Machina was essentially a series of scenes in which two people talk in a room. It's an impeccable movie, but one that just as easily could have been a theatrical production rather than a cinematic one. It's the same with the sound design, which I'm sure was much more terror-inducing in a cinema than being pumped out my admittedly piddly soundbar. In the future, I'd love to get a beefier setup, but then, it's not as if -- in a town house with a toddler -- I'd ever get the opportunity to use it. The behind-the-scenes saga of why Annihilation came to be on Netflix is a fascinating one, especially since Paramount is now using Netflix as a dumping ground. This and The Cloverfield Paradox were both medium-budget sci-fi movies that the accountants were nervous about releasing. 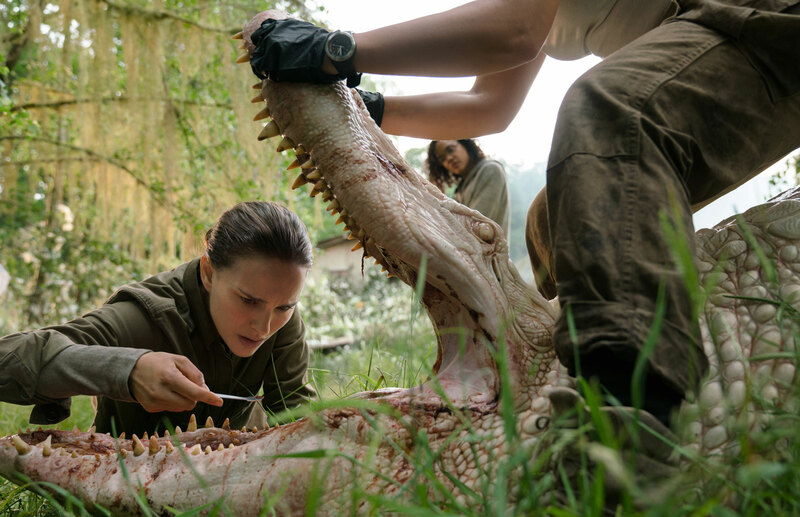 According to the Hollywood Reporter, Paramount's David Ellison felt that Annihilation, a mid-budget, cerebral, arty sci-fi movie, would alienate audiences. Which is doubly interesting, given that Paramount did quite well with Arrival, a mid-budget, cerebral, arty sci-fi movie that it released in 2016. I should add that Annihilation is as brilliant as Ex Machina, even if it lacks that movie's exploration of such a stone-cold sci-fi premise. It's also one of a small handful of thought-provoking films that seem to have "tentpole classic of the genre" nailed on them from the moment they're released.